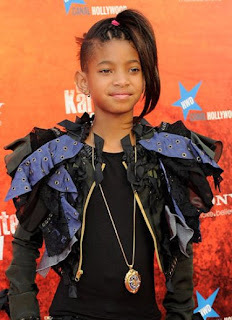 Music newcomer, Willow Smith, has offered her opinion on the actions of Chris Brown. For the second time in two years, Brown has narrowly avoided criminal charges. The Virginia singer had a temper tantrum on the set of "Good Morning America." Chris Brown has been trying to move past his 2009 public fight with Rihanna. Brown nearly lost his entire career over the situation and he is ready to move on. Each time he is mentioned, the incident is too. When the question came up on "Good Morning America," Brown lost it. He stormed off the set and went back to his dressing room, demolishing the room. ABC refused to press charges against the singer. Roc Nation artist, Willow Smith is upset with the entire situation. She does not think Brown should go to prison for his actions at "Good Morning America." However, she is wondering why he is not in prison right now for beating Rihanna in 2009. The comment was posted via Twitter and it was soon removed, as some of the information was incorrect.